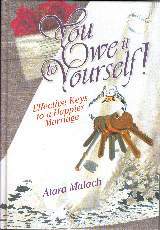 You Owe It To Yourself, by Atarah Malach, is a compilation of up-to-date psychological insights, creative ideas and real life examples gleaned from years of study and counseling. Sparkling with Torah hashkafa and the heartwarming wisdom of our sages, this book will help newly-weds, as well as long-marrieds, build a happier marriage. The dialogues and practical suggestions, geared to both men and women, will empower you to enhance your marriage. Hardcover.